They didn't do anything, Kurt was found by Jillian without his clothes on for certain circumstances, and he said something like:urg"Could you put that knife some place else? ":naughtyif ya know what I mean. didn't he flirt with/maybe more 2 of the savage land mohawked hotties...the same time Colossuss knocked one up? I want to be on that list...yum! What about Rachel? didn't he kiss her in Uncanny 450? What ever happened to Cerise/:cerise is she stuck in the dreaded comic book limbo? But he shouldn't be stuck with just anyone. And I am content that Cerise at least got some kind of send-off. Weeelllllllll....can I add my two and a half cents worth?? Let's see how many fan fics have added love interests, hmnnnn??? :D Elissa has been on my bunsen burner abrewing since I whipped up the character twenty ...URP!! ( Hush, 'Child! )...TIME FRAMES!! URGH!!! Actually, my character is kind of an illustration as to how no idea is truly original...or at least thanks to the proliferation of writers in this world there is a guarantee that there is no truly original idea in this world. She is a telepath, but empathic like Meggan, yet different in that her empathy allows her to heal others besides herself. It also attibutes to some pretty charismatic bonding ability. She also is alien like Cerise, though Earth standard humanoid, and arrives due to genocidal maniacs that want to slay the last of mutantkind on her world. But since our favorite elf is a true romantic, and lover of all that is good and fair in this world...VIVE L'AMOUR!! C'EST LA VIE!!! Sir Bamfalot will always be having a new love on his arm, or with his tail wrapped around her waist! Let's see what our imaginations can concoct, n'cest pas? 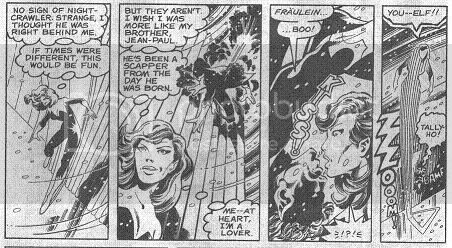 I was wondering if Nightcrawler was ever romantically involved with and non-aliens or women who weren't either relatives or teammates? Also, have Nightcrawler and the Scarlet Witch ever met in the mainstream reality? Below is just the result of procrastination/boredom - all the ladies who play significant (not neccessarily romantic) roles in his life. Am I missing anyone? I'd completely forgotten about that ! It's too late, I'm afraid, I already own that team up with the West Coast Avengers - not the best story arc with Kitty handing the soul sword over to Doom on just his word, and I also didn't like the art. But, Kurt does get his powers back and I liked how well he and Wanda got along together. It was kind of fun that they both spoke German and were able to confound their enemies by using that. "You dare lay a hand on the royal person that is my daughter!?" "Well...even though I haven't...you can't honestly believe it was my hand I lay on her..."
"Why are the cute ones always so stupid...?" Yes! The House of M was a great opportunity to do something with Nocturne and the Scarlet Witch. I was hoping that at the end of the arc everyone would remember both worlds and have to readjust themselves. For instance, Kurt and Rogue would have fond memories of their mother and the time they spent in the red guard. So, after everything went back to normal - it would make more sense for Mystique to join the X-men - mostly because they'd have something to talk about. Anyway, I wish they'd gone there. Well, actually, since way back in the Claremont days. he's love triangling with rachel and storm at the mo in essenstial. I take this opertunity to ship and say: i really hope he gets together with storm. Yes, that is the influence of X2 you can smell on me. It doesn't work with blue furry skin, unless you use a lot of foundation. "Doctor, ever since I got back from that alternate universe populated entirely by Amazon women I've had this ... problem ..."
"Looks completely normal to me, Mr. Wagner." "Ach, wait, let me turn off the image inducer." "Good God, it's blue! Somebody call the CDC!" "No, it's always been blue, I mean this!" "It's three feet long and pointed on the end!" "That is my tail you idiot!" So I'm out of th loop and *just* picked up old issues of Uncanny (and need to really update my reading...) I know Storm's married these days- but what happened with that infamous kiss with Rachael? Nothing. Rachel's been canoodling with some Shi'ar guy while on this big space adventure with Havoc, Polaris, and the remainder of the Starjammers. Kurt's back on earth doing pretty much what he's been doing lately, which isn't much.